We raised a massive £1,500 at the fantastic Forever Manchester Women’s event on Wednesday 7th October, kindly hosted and sponsored by KPMG. The event was attended by over 90 women from businesses across Greater Manchester, which meant the evening was a complete sell out once again. 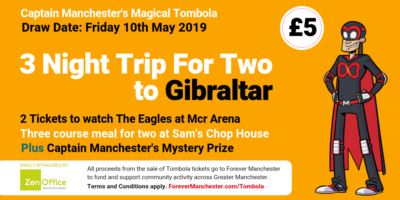 It is thanks to their attendance and taking part in the raffle that we are able to fundraise to support female-led community groups across the whole of Greater Manchester. Thanks to Fazenda, Croma, Restaurant Bar and Grill, Verdure Floral, Macdonald Hotel, Great John Street Hotel, Ward Hadaway and Mr Coopers for the raffle prizes. Also a huge thank you to our two wonderful speakers, Sandy Lindsay MBE and Peggy Mulongo. Sandy Lindsay was named a Member of the British Empire for services to business and young people as well as North West Director of the Year (SME) by the Institute of Directors. She is also the founder of Tangerine and Vice Chair on the board of trustees Forever Manchester. Sandy talked about her career and her thoughts on women in business. She talked about the 5 key elements that she has learnt over her career so far, these include “get yourself in the room”, “follow your gut”, “take risks”, “be brave” and finally remember to “give yourself a pat on the back”. Alongside this, Sandy also advises that you should always maintain a code of ethics. A successful business and ethics are not mutually exclusive. Also speaking was Peggy Mulongo who is a qualified Mental Health Nurse (RMN) and a Cross-cultural Therapist. Peggy has 14years’ experience of working with Black and Minority Ethnic (BME) communities in the UK, and she is the co-founding member of NESTAC, an organisation addressing the needs of African communities living in Greater Manchester, since 2003. @JeanieFM @4EVERManchester @KPMG @SandyLindsay @NestacMCR inspirational speeches and an amazing event. Me and @Ali_R_MCR thoroughly enjoyed! Peggy spoke about the work they are currently doing and how they use holistic approaches, campaigning and bespoke trainings to positively change and improve life chances for young girls and women who have undergone FGM and those at risk of FGM. It was a shock to hear about how much of this still goes on and truly inspiring knowing how hard Peggy and her team are working to help educate people. We couldn’t be more thrilled at the responses to our speakers, showing that you can do amazing things in your local area and really make a difference to people’s lives. The next Forever Manchester Women event will be in January 2016, so keep an eye out for when tickets go on sale later this month. You can help us fund and support local community groups, such as Nestac, in your area by making a donation today.